1. What were these devices commonly called? A: Hand grenades, or hand grenade fire extinguishers. 2. What problematic fluid were they often filled with? ...which frequently happens in fires. 3. 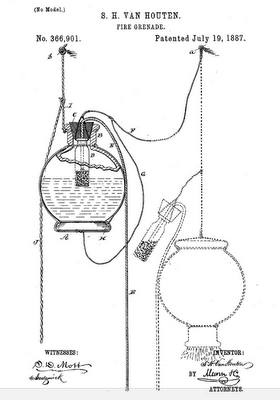 Can you find the original patent for this device? or sodium bicarbonate). This version became most popular in the US. Background: In the 19th century, fires were a big deal. They were much more common than now, with buildings and interiors being made mostly of flammable substances and fire-fighting technology being much less capable than it is today. Inventors started building any number of clever, and occasionally Rube Goldberg-ian fire-fighting devices, of which the fragile, fluid-filled globes known as “hand grenades” were possibly the most common at the time. I first ran across this notion when I was reading through an old address directory for 1895 and found an ad for “hand grenades.” That surprised me a bit, so I started looking into the topic. What I found was this amazing bit of tech from the 1800’s. Fire grenades were sold as essential household items, and the advertisements played up their ease-of-use (especially by women in peril, a common thread at the time). If you look up the patents, you’ll find an amazing technology battle as inventors tried to create ever better grenades, sometimes with remarkably bad idea. 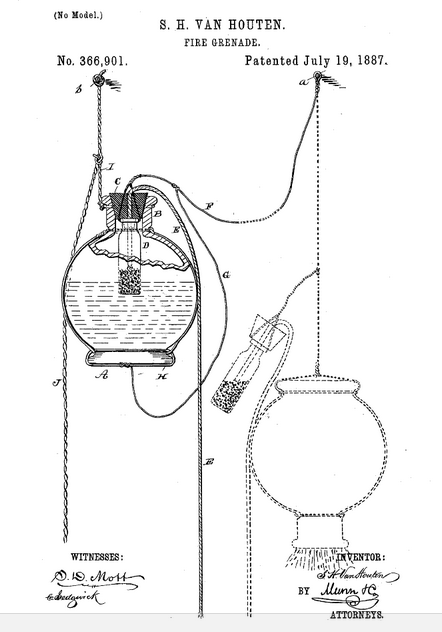 For instance, Van Houten patented a fascinating device (US366901) that uses a burnable string causing the bottle to pivot and spill the fire extinguishing agent out on the fire below. BUT if the stopper gets stuck, it also has a small glass bottle of gunpowder to be set afire by another burning string and that will shatter the bottle. 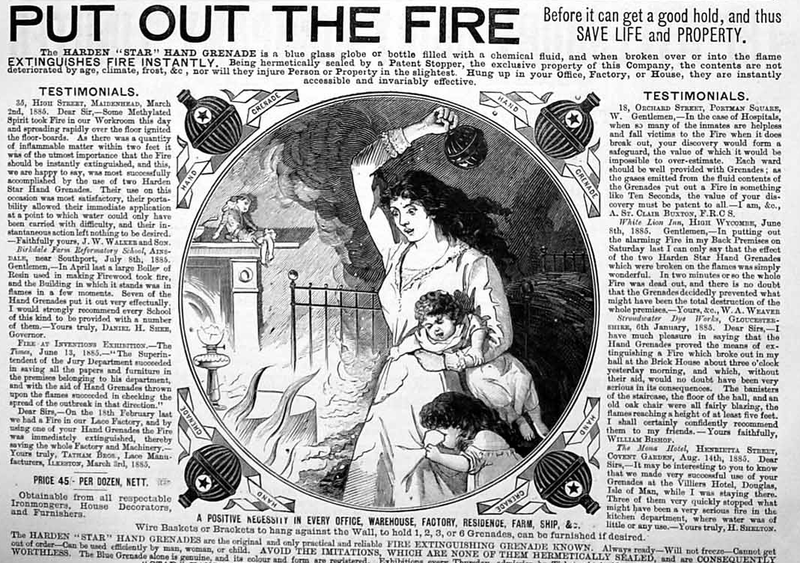 [ fire fighting shatter 1800..1900 ] to find: They’re called fire fighting grenades. Since I knew they existing in the 19th century, I used the number operator (1800..1900) to find dates associated with the web pages from that era. [ fire fighting grenades fluid ] to find: That they were often filled with carbon tetrachloride. Okay, got that. Why is it problematic? Is there some hazard associated with carbon tet? [ carbon tetrachloride hazard ] to find: That carbon tet, when breathed, can damage the lungs and kidneys. What’s more, it’s easily converted in the presence of heat to phosgene gas, a major chemical weapon used in World War I. Obviously not something you’d want to use in an enclosed space, such as a fire in the home. There were three different approaches to this challenge. 1. Globe: 7 of the initial queries had the word “globe” in the query. You picked this up from the language I used in the challenge (which is fine)… but note that it’s a fairly uncommon word. If I were devious, I might have used that word to throw you off the path. As it was, I planned it as a hint. 2. 19th century: 8 of the initial queries had “19th century” in the query. That’s not a bad way to build the query, but if it hadn’t worked, you’d be right to take it out of your query and try it without that specifier. A time period can be overly limiting your query. For example, suppose these things had been popular in the 17th century as well… then nobody would have written about them in conjunction with the phrase “19th century” and you would have wasted a lot of time. 3. Historical: 3 people had initial queries that were fairly broad, looking for the history of firefighting or antiques. That’s not a bad approach (and the person who used the number range operator, 1800..1900, echoed what I did myself). Finally, it’s interesting to see the 3 initial queries that did NOT work well for their searchers. Everyone was able to do the challenge, but compare these unsuccessful initial queries with those that worked. As you can see, the difference is often just adding a word or two. Since it’s so fast to iterate, these searchers were right to extend their queries to include the missing word or two that got them to fire grenades. This search was very interesting for me. I am an engineer and found the descriptions of the fire grenades in the old patents a great read. Plus lots of pretty pictures of these glass collectibles and the great advertisements. When I first started these searches I went for speed. Now I slow down and "smell the roses" or in this case the poison gas. Thanks to you and all fellow searchers. may not have the colored glass containers anymore, but CC14 in modified form is still very much in use in many devices... speaking of an enclosed space, how about a submarine? "[ carbon tetrachloride hazard ] to find: That carbon tet, when breathed, can damage the lungs and kidneys. What’s more, it’s easily converted in the presence of heat to phosgene gas, a major chemical weapon used in World War I. Obviously not something you’d want to use in an enclosed space, such as a fire in the home. " Solved the first two queries but how to find the original patent for the device? Kindly let me know. Google has a special patents search engine: google.com/patents Using "hand grenade fire extinguisher" and sort relevance by oldest filing date (one of the last options on the left hand side bar), I found Habden filed for a patent on Aug. 14, 1883. I just discovered that handy feature doing some intellectual property cataloging so it's fun to get to use that specific search engine so quickly. How to find the original patent for the device? In my search, I found information that says the first American patent was issued in 1863 to Alanson Crane of Ft. Monroe, VA. I've been unable to find the actual patent, but surely it has to be out there, right? Scroll down to April 15 for start of transcript. If you want know how found this court case let me know. A little off topic, there is a new glass grenade available, for those of you that like a bit-o-bourbon. There are some great photos from your blog ( put out the fire and harden prints above) that my production company ( santa monica, CA ) would like to license for broadcast television use. Are you available to speak and point us in the right direction? Where are the photos from, etc etc? Once I hear from you, I would be glad to exchange emails. Thanks so much and look forward to hearing from you. In the case of the patents, they're from Scholar.Google.com -- with the obvious searches! When you say "copy the link" , which link are you referring to for the photos? Answer: A vanished department in the university?